Part of how I reach and help people involves running the community forum, The Roundtable, over on the metaphysical based site I founded, and continue to run as editor, transients.info. I just came across a post where someone was asking about crystal clearing and charging. While responding, I decided to also cover activation and dedicating. All crystals should be cleansed unless you find them directly in the ground, in their natural state. In that situation you would be their first owner. The energies they hold will therefore relate to its presence and growth over time, in that area. Crystal clearing is helpful for all crystals that come to you, whether you keep it in your home, at your desk, on your person, or elsewhere. I don’t do all these activities below this with all my crystals, as I have so many, but I have done this for the ones I consider more important and which I use often. As you can imagine, sometimes you have a lot of crystals and it could be very time consuming. If you are using crystals for a specific purpose, you should also activate them to maximize the effect of their properties. This includes carrying them on your body. Always remember to hold the appropriate intention with the activity you perform. Remember, your intentions are everything. Crystals are very sensitive and pick up many energies. When using water, be careful, as some types of crystals dissolve. For example, kyanite and selenite are very delicate — any crystal that fractures shouldn’t be placed in water. Place them in sea water, or salt water, and wash them carefully. Don’t leave them for too long. You can also use any type of water, including mild soapy water. It doesn’t have to be salt water. Make sure you have the right intention when placing them down to rest during this process. In this case you want to clear away any energy that does not belong, and any energy that is not beneficial for you. Cluster based crystals are great because they can cleanse other crystals, just make sure they have also been cleansed and activated beforehand. Place the smaller crystal inside, or on, the cluster. Clear quartz and amethysts are especially great for this purpose. 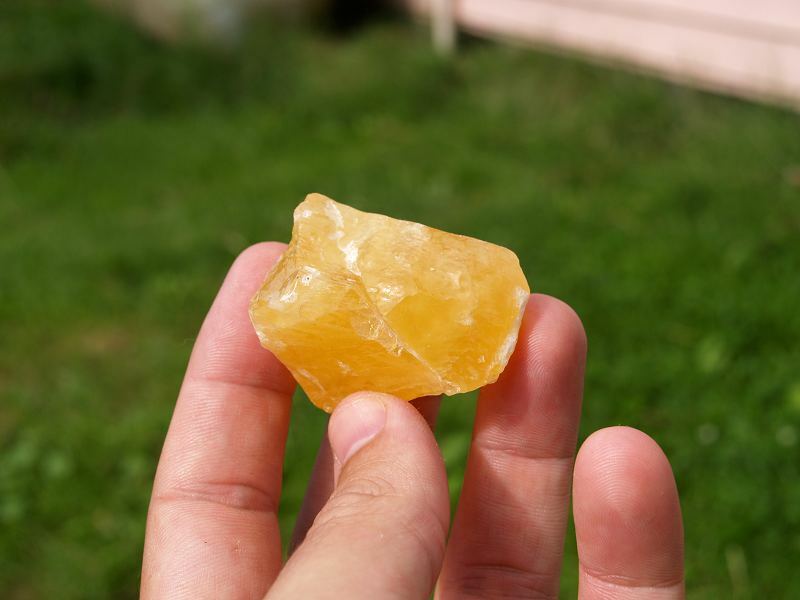 Citrines can also provide the properties of abundance and amplification to other crystals, where amethysts and clear quartz would clear negative energy. I also use this method when performing certain actions when doing energy healing. Place the crystal in your left hand. If it’s terminated, face the termination point out. Enclose your fingers around it. Bring air up from your abdomen after taking a deep breath, and blow sharply on the crystal, while holding the intention of clearing and cleansing the crystal. Also imagine a very pure white energy coming out of your mouth, over it. From using this technique, you are utilising the Earth’s magnetic field. Dig a hole in the earth and place the crystal inside, covering it up again. Alternatively, just place it on the ground with the intention of clearing it. You can place all your crystals together and use a sage smudge stick over them for a few minutes. This may also be helpful if you have a lot of crystals throughout your home, or space. With each of these methods above, you can also use an affirmation. And give thanks with genuine gratitude, after saying that. Feel free to modify that affirmation to suit your belief (or non-belief) system. Place the crystal in the sun for about an hour, or until you sense it’s charged. The Sun’s energy is masculine, and this means the time required to cleanse it is usually quicker than the moons energy. Note that some crystals lose their color if left in the sun for too long. A more popular method is to place them all in the light of a full moon overnight, right when it’s at its fullest. Consider eclipse periods too if you don’t charge your crystals often. Depending on the type of crystal, a crystal will pick up things naturally over time, before and after it’s been cleansed. For example, record keepers are types of crystals which are known to record more information than other crystals because of how the crystal is formed. Record Keepers have tiny triangles inside. Most of the time they are quartz based, but can occasionally appear inside other crystal types such as kunzite and rubys. I purchased some cheap crystal in Peru, back in 2011, while on a spiritual group quest/journey. There was a native Q’ero Shaman traveling with us during part of our time there, who performed five traditional ceremonies for us creating a mandala each time. At one point, on an island at a sacred site on Lake Titicaca in Bolivia, he blessed our items, including our crystals. I gave him all of mine, which I carried a long way in a bag on my back — which were heavy as I had some big ones. This was a very special blessing and meant a lot to me. The Q’ero Shaman did not speak English, so I don’t recall the specifics of the blessing. We each have the power to bless our own crystals. We each can use thought based forms to empower them. There are many methods to do this. Just like our intentions are so important with all of these activities around crystals, from clearing, charging, activating and so on, we can also make them into specific tools for our use. When you create a wand filled with crystals, you set an intention around what that wand will be used for. You also pick crystals for the wand which you think will benefit that exact purpose. The same concept applies when blessing a crystal. Around 2010 I went to a retreat, south of Sydney in Australia. It was a long time ago, so I can’t recall the exact details, but it had a vegan menu, yoga and meditation. A Hindu based guru had founded the center. 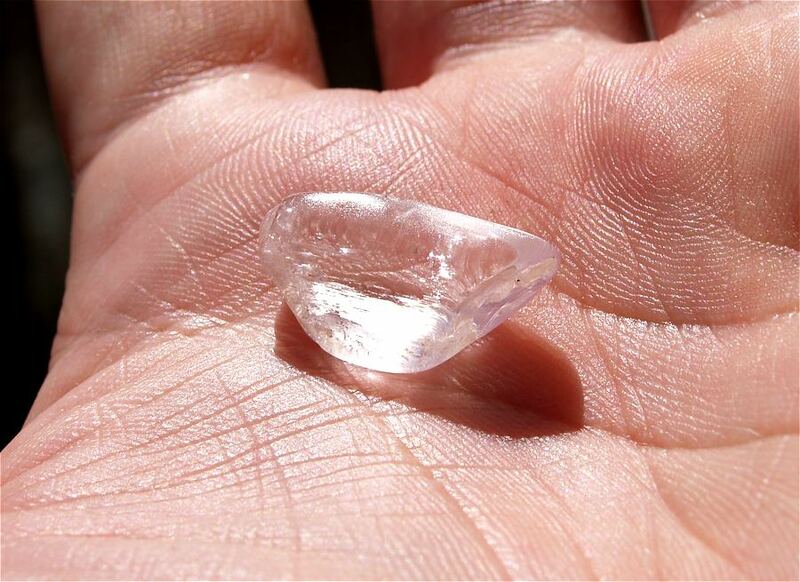 On one of the days, after singing a mantra for a long while, we were given a small oval shaped clear quartz crystal which had been blessed by the retreats founder. There were some rules around possessing it, such as never dropping it on the ground, or it would lose its blessing. Someone dropped theirs right in front of me not long after getting handed it. Our belief system is powerful. If you think someone like that can bless your crystal, amulet, or any item — so can you. If you think it’s going to lose its blessing when it touches the Earth, well, it all depends on how strongly you believe that — the strength of your thought forms and that of the person that blessed it. To activate a crystal, you can use the following method. 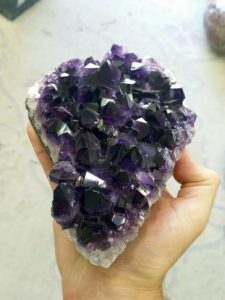 Hold the crystal in your left hand, as this hand is connected to your heart and your spiritual self, where the right hand is connected to your physical self. Place it adjacent to your heart chakra. If it’s terminated, point the terminated end directly up. 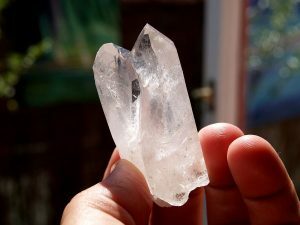 Focus on creating a lot of bright white light around the crystal, as well as the energy and intention of love. And once again, surround that crystal with all that light and love. After feeling into this, you should get a sense of when is enough, so you can stop. After this, it’s time to dedicate the crystal to the universal purpose.